Even with its simple business model, this barbershop is proving to be a real success. Husband-and-wife tandem Albert and Mimi del Fonso have been looking for a business for a while before finally deciding to set up a barbershop, believing it had staying power. Now on its third year, The Good Barber is a simple, no-fuss barbershop whose main selling point is its retro feel. “We really just want to offer the basics,” says Albert, noting the idea for the barbershop came from his childhood memories of going to the barber with his dad. Apart from a relatively short list of services—haircut and coloring, shave, massage, scalp and facial treatment, manicure or pedicure, and foot spa—The Good Barber offers a comfortable and welcoming ambience, complete with old-fashioned music and wood-finished interiors. One of the draws for clients is its pricing: a haircut costs just P120, a shave P150. The shop’s approach to providing additional value to clients is as simple and straightforward as its basic offerings: Customers can pick any two or more services at a discounted package rate. “Our motto is ‘quality at a comfortable price,’” says Mimi. In addition to intentionally limiting their list of services to just the basics, the couple also only use local supplies—part of their initiative to support local industries. 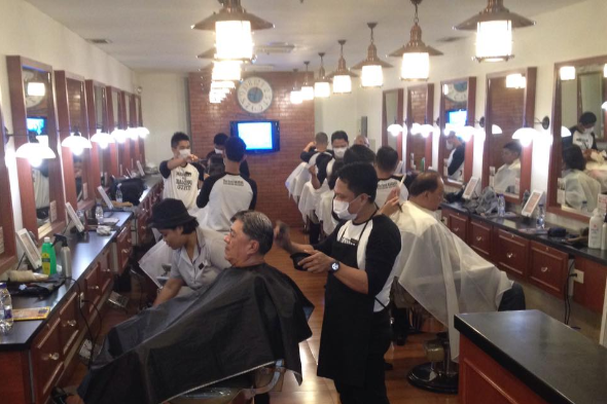 The barbershop also prides itself on having staff that are well-trained and well-compensated. “If you take care of your people, they will take care of your customers,” says Albert. Since setting up the business in 2012, the shop has gained a loyal following, with the del Fonsos boasting they have regulars who come in at least once a week for trims or shaves. 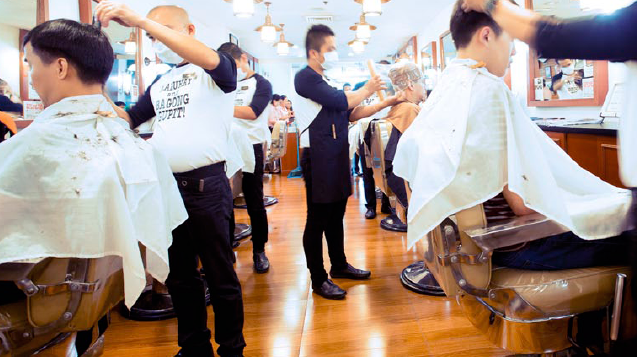 Currently, the couple say The Good Barber serves hundreds of customers daily at their Robinsons Galleria branch in Ortigas, currently their only shop. Due to the shop’s success, the del Fonsos have now opened the brand for franchising, which they started to consider during their second year of operations. “Even if times are hard, you’ll always need to go to a barbershop. You can skip dining out, but you’ll never skip going to a barbershop,” adds Mimi.